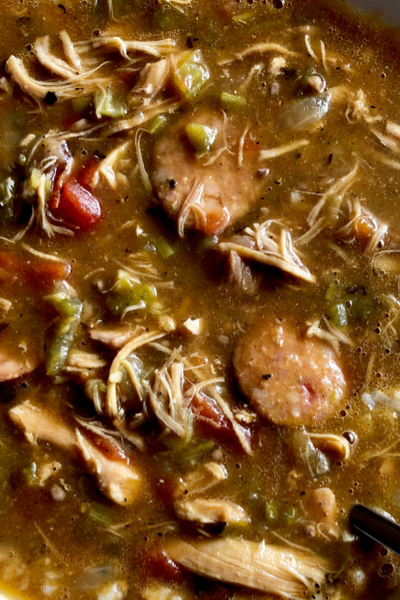 You can’t think of New Orleans and not think of Gumbo. It may not be the first thing that comes to your mind, but when you talk about New Orleans food, I am sure it is at the top of the list. 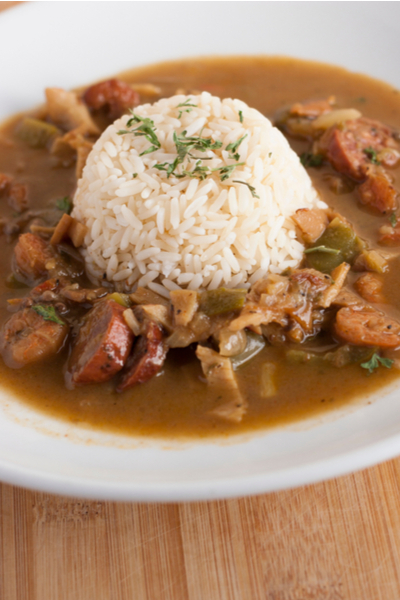 One of the reasons that Gumbo is so popular is that it is extremely versatile. A bowl of Instant Pot Gumbo. Although today most Gumbo recipes can be put into two categories, seafood and non-seafood, that wasn’t always the case. There are recipes listed in books that date back to the early 19th century that include all sorts of ingredients. From quail, duck, oysters and beef, it has all been done. But one thing has been consistent with gumbo, it needs a thickening agent. Today you will find that a roux will be used in nearly all Gumbo recipes. That holds true in Instant Pot Gumbo as well. Continue to cook the roux until a peanut butter color, or darker if preferred. Traditionally the roux in Gumbo is much darker and thicker than in other dishes. The combination of flour and butter is cooked down and browned until it is anywhere from a peanut butter color to a light chocolate hue. The purpose of the roux is not only to give it that infamous dark color, but it also to thicken the recipe to a stew like consistency. However, there are two other ways to thicken this recipe. Okra is one of the most common way and it is readily available in the South. Once cooked down, the okra nearly disintegrates and provides for a hearty and thick dish. And although no longer the preferred method, file powder was another agent used to thicken the pot. Unlike okra, file powder is actually served at the dinner table. Each individual could add the desired amount to their own dish to thicken it to their own liking. Gumbo typically cooked for hours, low and slow, on the stove top. That way all the flavors had time to meld perfectly with each other. Brown the chicken on all sides and remove from the liner of the Instant Pot. But that was before Instant Pot Gumbo! We used our Instant Pot 6 quart Duo for this recipe. Pressure cooking allows all of the flavors to come together to produce a dish that tastes like it has been cooking all day, and within a fraction of the time! The andouille sausage is already pre-cooked. And when chicken is cut up in small pieces, it only takes minutes to cook in the Instant Pot. Not to mention that shrimp really only needs to be submerged in a hot liquid to cook properly. Cooked Instant Pot Gumbo, ready to cook the shrimp! So that means that this delicious Instant Pot Gumbo can be on the table in under 45 minutes! And this includes the time that it takes the pot to come to pressure! Not bad for a typical, cooked all day, type of meal! And don’t forget to serve homemade French Bread to mop up all of the goodness at the bottom of the bowl! Check out some of our other New Orleans Inspired Recipes including Instant Pot Cajun Chicken on our website! And for another great shrimp meal try our Shrimp and Arugula Risotto recipe. 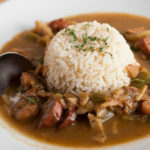 Classic New Orleans Gumbo made with chicken, sausage and shrimp and filled with flavorful Creole seasonings and served with a bed of rice. 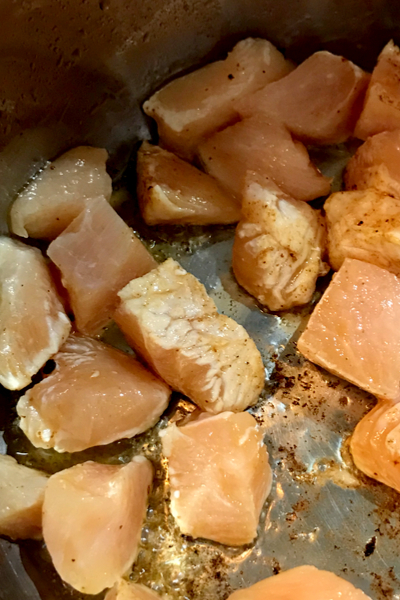 3/4 pound skinless chicken breasts cut into bite size pieces. Push Sauté button on the Instant Pot. Once the display reads HOT add 1 tbsp of the olive oil to the pot. Then add the andouille sausage. Cook until brown on both sides, approximately 5 minutes. Remove the sausage from the pot. Add in the chicken pieces and brown on all sides, approximately 3-4 minutes. Remove and set aside. Add the butter and remaining tbsp of olive oil to the pot. Slowly add in the flour while whisking constantly. 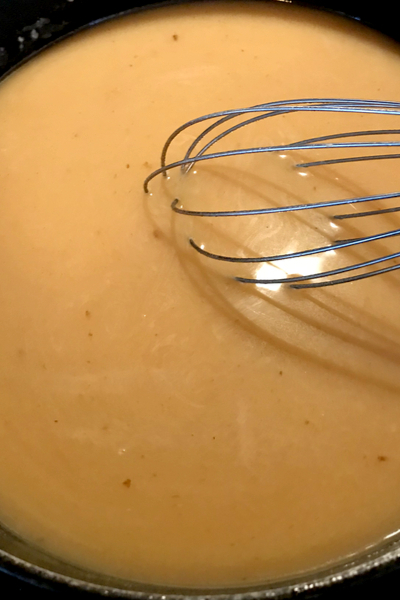 Continue to whisk until the roux resembles the color of peanut butter. Add the onions, celery and green pepper. Stir and cook for 2-3 minutes until the veggie begin to soften. Add the basil, oregano, thyme, Creole seasoning, cayenne pepper, garlic, and Worcestershire sauce to the pot and stir well. Add the chicken broth, diced tomatoes, okra, sausage, chicken, and bay leaf to the pot. Close the pot and place the valve in the sealed position. Pressure Cook/Manual on HIGH for 12 minutes. When cooking time expires, allow for Natural Pressure Release for 10 minutes. Manually release any remaining pressure. Place the Instant Pot on the Sauté function. Add the raw shrimp and cook for 3-4 minutes until the shrimp turn bright pink. Push Cancel/Keep Warm. What quantity is “1 inch andouille sausage”? 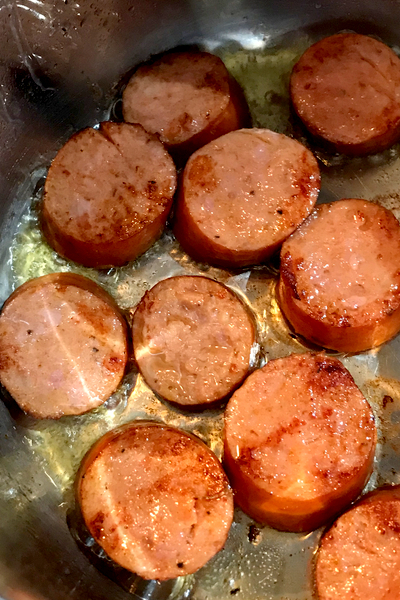 Hi Doug – the recipe calls for 1 pound of andouille sausage cut in 1/2 inch slices.